Michigan wines continue to gain notoriety as the restaurant Sixteen, located within Trump International Hotel and Tower Chicago, placed the 2005 Chateau Chantal Proprietor's Reserve Krupka Vineyard Cabernet Franc on their highly selective wine list. The winery released this older vintage wine from their library for this special placement and it is no longer available for sale to the public. Grown in one of Northern Michigan's record warm years, this wine has been highly sought after for its ripe fruit characters and ability to age. 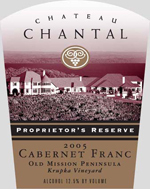 Chateau Chantal will release the highly anticipated 2010 vintage of Cabernet Franc later this year. Sixteen is the signature restaurant in the tower, located on the 16th floor of the Trump International Hotel & Tower Chicago. With renowned Executive Chef Frank Brunacci at the helm, Sixteen promises an eclectic fine dining experience matched by equally exceptional city views from the Trump Chicago hotel’s 30-foot floor-to-ceiling windows that frame spectacular vistas of Lake Michigan, the Chicago River and the Wrigley Clock Tower.